Rich Mullins begins pursuing a degree in Music Education at Friends University in Wichita, KS. French horn is only one of over nine instruments that Rich Plays, including piano, guitar and hammer and lap dulcimer. During this time, Rich served as the choir director at West Evangelical Free Church as part of his degree program. Rich and Beaker share a small house in town for the first two years. Rich meets and befriends James Bryan Smith, a professor of religion at Friends University around this time. Rich would live in Smith's attic appartment between 1992 and 1995. Smith would later write "An Arrow Pointing Toward Heaven," a biograpgy of sorts about Mullins. Smith: "He was brilliant, he didn't need to be in class with me. That was one of our running jokes." Rich and Beaker form the Kid Brothers of St. Frank. Mullins instructed his accountant to give him only $24,000 a year, the average working person's wage. The rest, he gave away when he found a cause. James Bryan Smith (Biographer): "Rich lived very simply. He had few possessions; he didn't care about money." Rich: "I think I would like to be a monk. I really considered Catholicism a few years ago, but there were some things that I just couldn't reconcile. But I thought, 'Why can't we have a religious order just because we're not Catholic?' It's hard to recruit people to a religious order, though. But Beaker and I pooled our resources and have set a salary for ourselves, and whatever comes beyond that we give back to the kingdom of God. We have a lot in common, a lot of things we don't particularly like about ourselves, but we help each other stay in line and are a good support system for each other." Rich writes "Calling Out Your Name." Lyrics for the song were started back in 1986 while touring with Amy Grant on the Ungaurded Tour. The song was finished while Rich was riding his motorcycle in the Flint Hills. Cynthia Clawson records a song written by Rich and Justin Peters entitled "If All I Know Is Love" on her Words Will Never Do album. "My One Thing" debuts on the AC Charts. It would spend 14 weeks on the chart and peak at #6. Rich Mullins performs in the Meyers Sports Complex at Trinity College in Deerfield, Illinois with Avenue G.
Rich Mullins performs in Beloit, WI. at Peoples Church. CCM Magazine reviews Rich's Never Picture Perfect album. Rich Mullins performs in Tribune, KS. Rich Mullins performs in Wichita, KS at Central Community Church with author, Frank Peretti. The event was called "Prayer Does Make a Difference" sponsored by Succesful Living and Crucible Productions. Rich's "Awesome God" is nominated for two Dove Awards - "Song of the Year" and "Contemporary Song of the Year." "Bound to Come Some Trouble" is also nominated for a Dove Award. "While the Nations Rage" debuts on the AC Charts. It would spend 14 weeks on the chart and peak at #1 on June 11. Rich Mullins performs in Winchester, IN with Avenue G as part of the "Never Picture Perfect Summer Tour". Rich Mullins performs in Upland, IN at Taylor University with Avenue G as part of the "Never Picture Perfect Summer Tour". 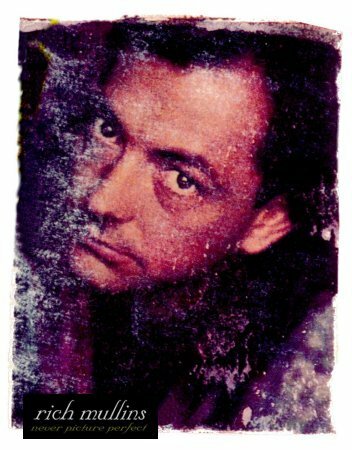 Rich Mullins performs in Wilmore, KY at Ichthus '90. Rich Mullins performs at the Ichthus Festival with Avenue G as part of the "Never Picture Perfect Summer Tour". Rich Mullins performs in Topeka, KS with Avenue G as part of the "Never Picture Perfect Summer Tour". Rich Mullins performs in Lincoln, NE with Avenue G as part of the "Never Picture Perfect Summer Tour". Rich Mullins performs in Boone, IA with Avenue G as part of the "Never Picture Perfect Summer Tour". Rich Mullins performs in Sioux Falls, SD with Avenue G as part of the "Never Picture Perfect Summer Tour". Rich Mullins performs in Peirre, SD with Avenue G as part of the "Never Picture Perfect Summer Tour". Rich Mullins performs in Rapid City, SD with Avenue G as part of the "Never Picture Perfect Summer Tour". Rich Mullins performs in Billings, MN with Avenue G as part of the "Never Picture Perfect Summer Tour". Rich Mullins performs in Libby, MN with Avenue G as part of the "Never Picture Perfect Summer Tour". Rich Mullins performs in Spokane, WA with Avenue G as part of the "Never Picture Perfect Summer Tour". Rich Mullins performs in Seattle, WA with Avenue G as part of the "Never Picture Perfect Summer Tour". Rich Mullins performs in Portland, OR with Avenue G as part of the "Never Picture Perfect Summer Tour". Rich Mullins performs in Eugene, OR with Avenue G as part of the "Never Picture Perfect Summer Tour". Rich Mullins performs in San Francisco, CA with Avenue G as part of the "Never Picture Perfect Summer Tour". Rich Mullins performs in Salinas, CA with Avenue G as part of the "Never Picture Perfect Summer Tour". Rich Mullins performs in Bakersfield, CA with Avenue G as part of the "Never Picture Perfect Summer Tour". Rich Mullins performs in Downey, CA with Avenue G as part of the "Never Picture Perfect Summer Tour". Rich Mullins performs in Phoenix, AZ with Avenue G as part of the "Never Picture Perfect Summer Tour". Rich Mullins performs in Alberquerque, NM with Avenue G as part of the "Never Picture Perfect Summer Tour". Rich Mullins performs in El Paso, NM with Avenue G as part of the "Never Picture Perfect Summer Tour". Rich Mullins performs in Abilene, TX with Avenue G as part of the "Never Picture Perfect Summer Tour". Rich Mullins performs in Austin, TX with Avenue G as part of the "Never Picture Perfect Summer Tour". Rich Mullins performs in Dallas, TX with Avenue G as part of the "Never Picture Perfect Summer Tour". "While the Nations Rage" hits #1 on the AC charts. After its debut on April 9, it would spend a total of 14 weeks on the chart. 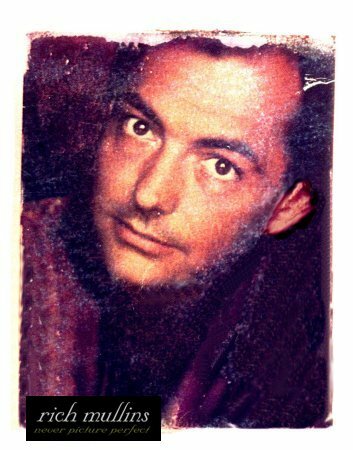 Rich Mullins performs in Shreveport, LA with Avenue G as part of the "Never Picture Perfect Summer Tour". Rich Mullins performs in Meridian, MS with Avenue G as part of the "Never Picture Perfect Summer Tour". Rich Mullins performs in Tupelo, MS with Avenue G as part of the "Never Picture Perfect Summer Tour". Rich Mullins performs in Memphis, TN with Avenue G as part of the "Never Picture Perfect Summer Tour". Rich Mullins performs in Knoxvill, TN with Avenue G as part of the "Never Picture Perfect Summer Tour". Rich Mullins performs in Johnson City/Milligan, TN with Avenue G as part of the "Never Picture Perfect Summer Tour". Rich Mullins performs in Johnson City,TN with Avenue G as part of the "Never Picture Perfect Summer Tour". Rich Mullins performs in Grayson, KY with Avenue G as part of the "Never Picture Perfect Summer Tour". Rich Mullins performs in Detroit, MI with Avenue G as part of the "Never Picture Perfect Summer Tour". Rich Mullins performs in Ft. Wayne, IN with Avenue G as part of the "Never Picture Perfect Summer Tour". Rich Mullins performs in Indianapolis, IN with Avenue G as part of the "Never Picture Perfect Summer Tour". Rich Mullins performs in Adrian, MI with Avenue G as part of the "Never Picture Perfect Summer Tour". Rich Mullins performs in Grand Rapids, MI with Avenue G as part of the "Never Picture Perfect Summer Tour". Rich Mullins performs in Toledo, OH with Avenue G as part of the "Never Picture Perfect Summer Tour". Rich Mullins performs in Pittsburg, PA with Avenue G as part of the "Never Picture Perfect Summer Tour". Rich Mullins performs in Cambridge Springs, PA with Avenue G as part of the "Never Picture Perfect Summer Tour". "Alrightokuhhuhamen" debuts on the AC Charts. It would spend 14 weeks on the chart and peak at #4. Rich Mullins performs in Lewisberg, PA outdoors in the football stadium at Bucknell University with Avenue G as part of the "Never Picture Perfect Summer Tour". Rich Mullins performs in Philidelphia, PA with Avenue G as part of the "Never Picture Perfect Summer Tour". Rich Mullins performs in Salem, NJ with Avenue G as part of the "Never Picture Perfect Summer Tour". Rich Mullins performs in New York, NY with Avenue G as part of the "Never Picture Perfect Summer Tour". Rich Mullins performs in Boston, MA with Avenue G as part of the "Never Picture Perfect Summer Tour". Rich Mullins performs in New Hampshire with Avenue G as part of the "Never Picture Perfect Summer Tour". Rich Mullins performs in Burlington, VT with Avenue G as part of the "Never Picture Perfect Summer Tour". Rich Mullins performs in Troy, NY with Avenue G as part of the "Never Picture Perfect Summer Tour". Rich Mullins performs in Utica/Oriskany, NY with Avenue G as part of the "Never Picture Perfect Summer Tour". Rich Mullins performs in Buffalo, NY with Avenue G as part of the "Never Picture Perfect Summer Tour". Brennan Manning's The Ragamuffin Gospel: Good News for the Bedraggled, Beat-Up and Burnt Out is published. The author and the book would go on to be very influential to the life and career of Rich Mullins. Three years later, Rich would even call his band The Ragamuffin Band. Rich: "The preaching of Brennan Manning - we practice silence in the truck a lot of times so we hardly ever have a tape on or anything like that. But we don't have any rules - you can do what you want. But Beaker put in a Brennan Manning tape and I really didn't want to hear it because I didn't know who he was and don't ordinarily like preaching. I went 'Argh, great.' Well, I think about five minutes into it I think I had to pull off the road because I was just bawling my eyes out. I thought, what I am experiencing here is that I have gone to church ever since I was wee little, probably from when I was a week old, and this is the first sermon in my memory that is the preaching of the Good News of the Gospel of Christ. He's not preaching about an issue. He's not preaching about a theological position. He's not preaching about anything except this is the Good News. And I thought, wow, this is what I am hungry to hear. This is what I am dying to hear." Rich Mullins performs in Seling Grove, PN with Avenue G as part of the "Never Picture Perfect Summer Tour". Rich Mullins performs in Baltimore, MA with Avenue G as part of the "Never Picture Perfect Summer Tour". Rich Mullins performs in Roanoke, VA with Avenue G as part of the "Never Picture Perfect Summer Tour". Rich Mullins performs in Raliegh/Charlotte, NC with Avenue G as part of the "Never Picture Perfect Summer Tour". Rich Mullins performs in Cullman, AL with Avenue G as part of the "Never Picture Perfect Summer Tour". Rich Mullins performs in Huntsville, AL with Avenue G as part of the "Never Picture Perfect Summer Tour". Rich Mullins performs in Chattanogga, TN with Avenue G as part of the "Never Picture Perfect Summer Tour". Rich attends a release party for Reunion Recording artist, Morgan Cryar. Rich Mullins performs in Kingsport, TN with Avenue G as part of the "Never Picture Perfect Summer Tour". Rich Mullins performs in Greensboro/Raleigh, NC with Avenue G as part of the "Never Picture Perfect Summer Tour". Rich Mullins performs in Columbia, SC with Avenue G as part of the "Never Picture Perfect Summer Tour". Rich Mullins performs in Atlanta, GA with Avenue G as part of the "Never Picture Perfect Summer Tour". Rich Mullins performs in Cape Girardeau, MO with Avenue G as part of the "Never Picture Perfect Summer Tour". Rich Mullins performs in Bolivar, MO with Avenue G as part of the "Never Picture Perfect Summer Tour". Rich Mullins performs in Kansas City, MO with Avenue G as part of the "Never Picture Perfect Summer Tour". Rich Mullins performs in Columbia, MO with Avenue G as part of the "Never Picture Perfect Summer Tour". Rich Mullins performs in St. Louis, MO with Avenue G as part of the "Never Picture Perfect Summer Tour". Rich Mullins performs in Springfield, MO with Avenue G as part of the "Never Picture Perfect Summer Tour". Rich Mullins is the guest speaker at the Quaker Youth Young Friends Yearly Meeting in Greensboro, NC. He and Beaker also performed at the event. Rich Mullins performs in Sioux St. Marie, MI with Avenue G as part of the "Never Picture Perfect Summer Tour". Rich Mullins performs in Wichita, KS with Avenue G as part of the "Never Picture Perfect Summer Tour". Rich Mullins performs in South Bend, IN with Avenue G as part of the "Never Picture Perfect Summer Tour". 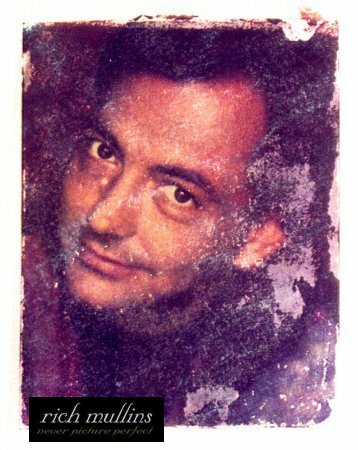 Rich Mullins performs in W. Lafayette, IN with Avenue G as part of the "Never Picture Perfect Summer Tour". Rich Mullins performs in Rockford, IL with Avenue G as part of the "Never Picture Perfect Summer Tour". Rich Mullins performs in Dubuque, IA with Avenue G as part of the "Never Picture Perfect Summer Tour". Rich Mullins performs in Davenport, IA with Avenue G as part of the "Never Picture Perfect Summer Tour". Rich Mullins performs in Des Moines, IA with Avenue G as part of the "Never Picture Perfect Summer Tour". Rich Mullins performs in Dodge City, KS with Avenue G as part of the "Never Picture Perfect Summer Tour". Rich Mullins performs in Ponca City, OK with Avenue G as part of the "Never Picture Perfect Summer Tour". Rich Mullins performs in Oklahoma City, OK with Avenue G as part of the "Never Picture Perfect Summer Tour". Rich Mullins performs in Tulsa, OK with Avenue G as part of the "Never Picture Perfect Summer Tour". Rich Mullins performs in Lincoln, IL with Avenue G at Lincoln Christian College as part of the "Never Picture Perfect Summer Tour". Rich Mullins performs in Wheaton, IL at True Tunes with Beaker. Rich Mullins performs in Chicago, IL with Avenue G as part of the "Never Picture Perfect Summer Tour". 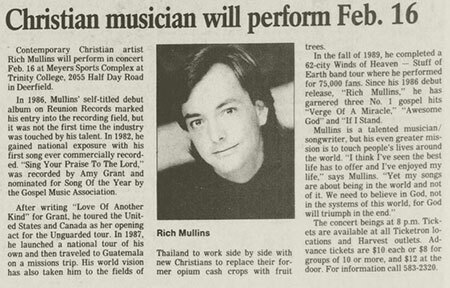 Rich Mullins and other artists, including Michael W. Smith, DC Talk, Rick Elias, Charlie Peacock, and Wes King, perform at Amy Grant and Gary Chapman's Riverstone farm in Franklin, TN for area teenagers. The event becomes known as "the Loft". "First Family" debuts on the AC Charts. It would spend 14 weeks on the chart and peak at #20. The Kevin Kostner film Dances with Wolves opens in movie theaters. Rich becomes slightly obsessed with the film seeing it at least two dozen times in the theater. Bernie Sheahan: "I watched him in the control room as he nearly burst with joy at the sound of us at worship, leaking heaven onto analog tape, with a song - something he and his best friend Beaker had crafted together, like a musical model airplane."